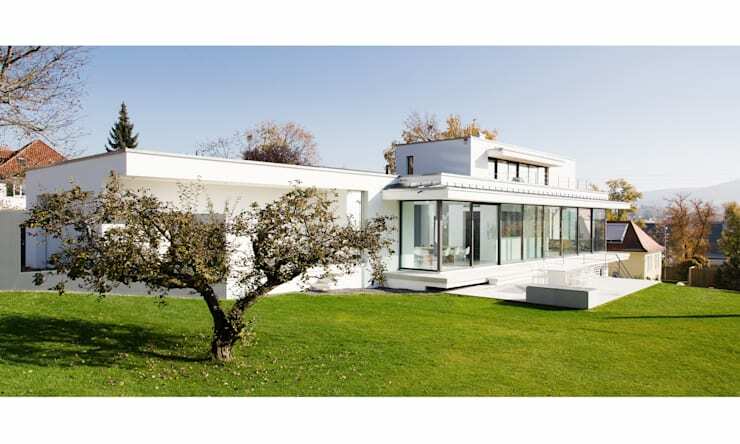 Built on a long and narrow piece of land a the foot of the Swabian Jura in Southern Germany, Haus Mauthe was designed by architect Anna Philipp for a family with a deep passion for art and graphic design. The architect's brief was to provide areas for family life that embraced creativity and openness, and offered space to display their collection of art pieces. 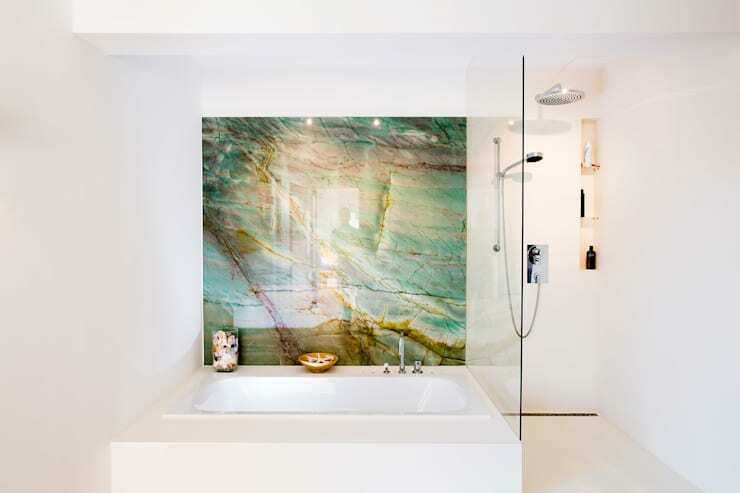 The end result is a stunning and light-filled home packed full of artistic details. Let's take a tour! Because of the plot's narrowness, the design was built around three long 'lines': a tree line, a water line – drawn by a long, narrow pool at garden level – and an art line, made up of the couple's art collection. These lines sort the property into distinct spaces. 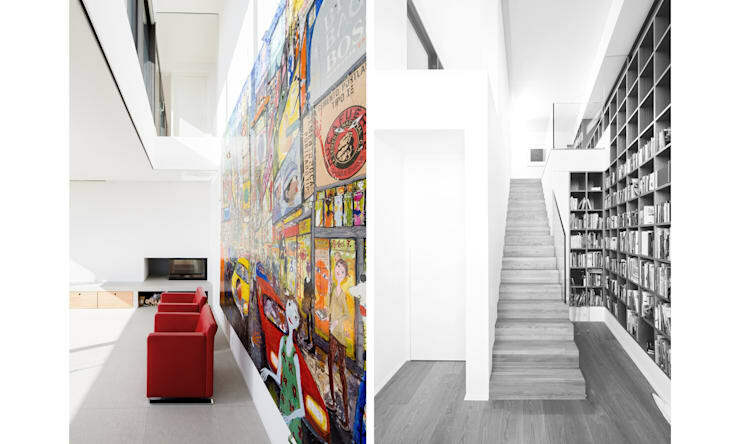 The art line divides the house into a public space that contains the living area, kitchen, and dining space and a private space containing a library and office that offers the family a place to retreat to. 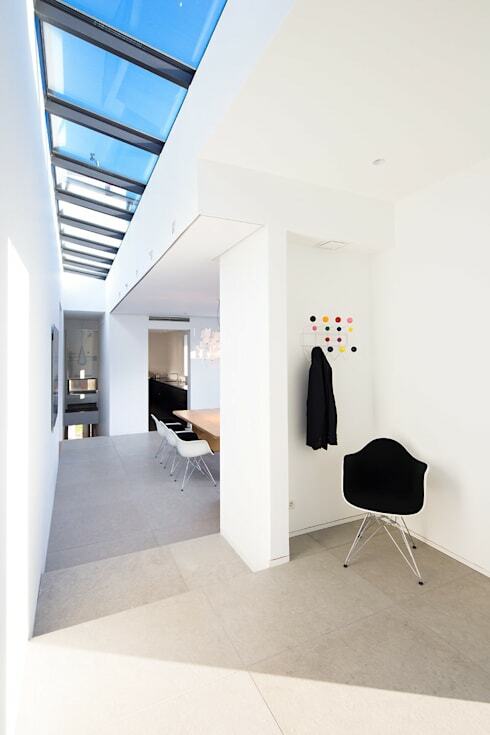 Skylights have been placed strategically throughout the entire building, and maximise available daylight. The art line divides the building into a horizontal public space containing the areas for living, cooking and eating, and a vertical, private area with a library and office which provide the family with a space to retreat to. The living area opens up at one end to double height, offering space for an impressive piece of pop-art. Two red chairs add even more colour. 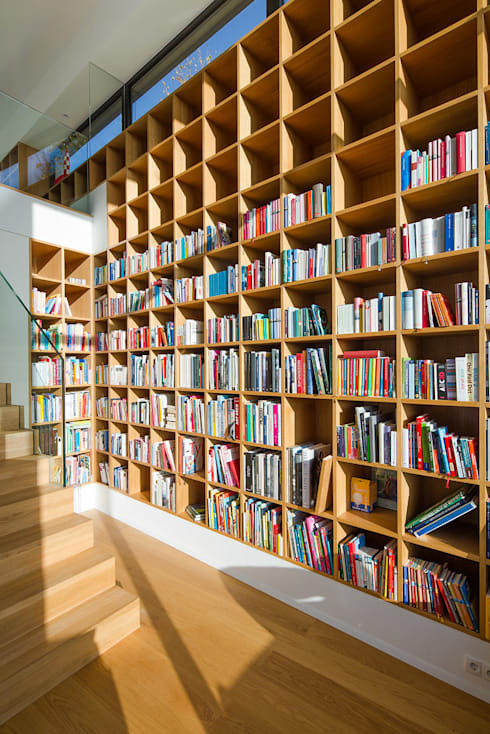 At this end of the house, a vertical 'block' creates a tower, which houses an extensive library of art and picture books which extends vertically over two floors. The staircase leads up to the office on the top level. The impressive two-storey library space. Light is a central feature of this home: floor to ceiling windows throughout flood the space with sunlight, while skylights add another dimension of light. Recessed lights in the ceilings and pendant lamps have been carefully arranged to show off the family's art, and to create different light tones in the evenings. 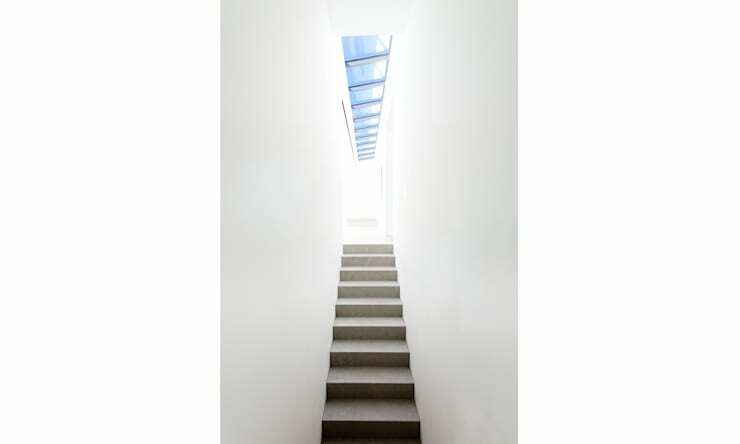 A staircase dazzlingly illuminated by the skylight above, with sunlight reflecting off the pure white walls, leads down to the garden level, where the family bedrooms are found. A long narrow pool and a large terrace have been built in front of this private area. The long narrow pool and terrace outside of the bedrooms. The bedrooms feature floor-to-ceiling glazing. Light reflecting from the pool dances on the white walls of the bedrooms. More dazzling white in the dining room, with light flooding in from the floor-to-ceiling windows and from more windows on the opposite side. Art is the central design theme of the villa. 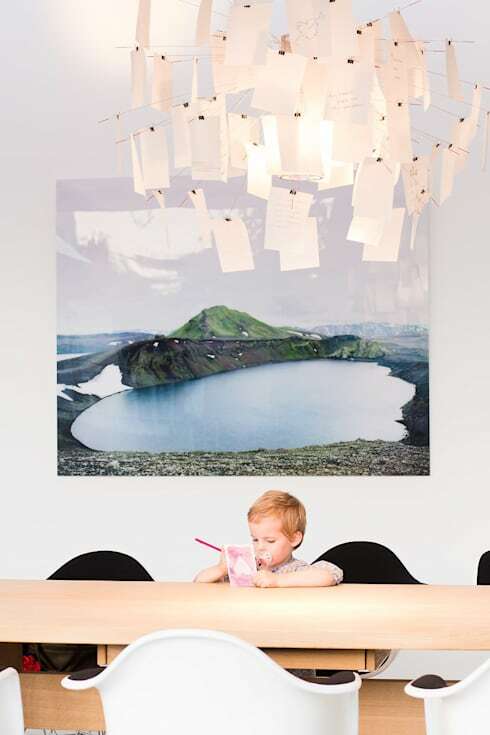 Hanging over the dining table is the 'Zettel-Lamp', designed by Ingo Maurer. The living spaces have been carefully planned so as to ensure order. There are a number of storage rooms, and a family wardrobe has been positioned in the hallway that leads to the garage, to help keep the entrance hall clutter-free. There's also a backup kitchen, to facilitate cosy get-togethers in a homely atmosphere. Even in the bathroom art is the main feature. This piece is made from natural Brazilian stone. The space is clean and clutter-free; airy and light. 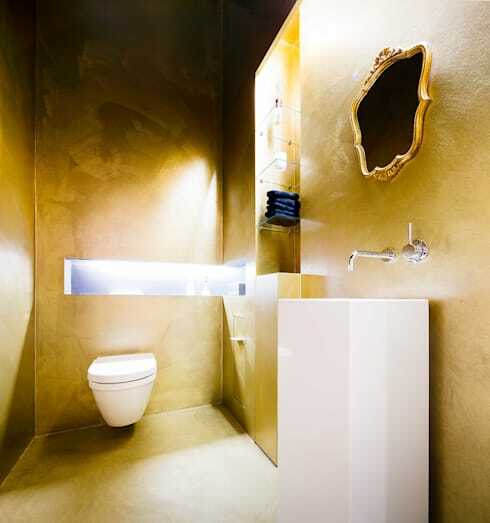 In the guest bathroom, it's gold as far as the eye can see. This bathroom is completely open to the sky. 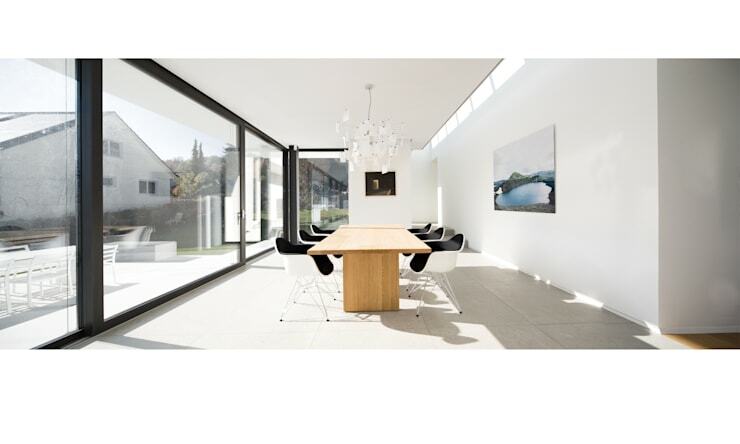 From the outside, we can see how the home has been divided into distinct spaces. On the centre level is the dining area and the living room; under this sit the family bedrooms, with that terrace and pool outside. The 'tower' peeks out over the centre level. Are you impressed with this villa of art and light? Let us know in the comments!